Cowley College hosted another successful Junior Day event Wednesday at its main campus in Arkansas City. A total of 91 high school juniors, five parents and one instructor attended the event. 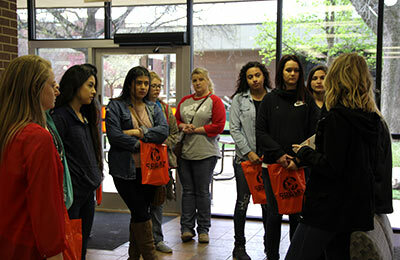 The purpose of Junior Day is for high school juniors to visit Cowley College’s main campus and to learn more about what the school has to offer. The day began with introductions and information about the college. Members of the Spirit Squad and Tigerette Dance Line entertained the students with performances, while Student Ambassador Gunner Johnson performed a juggling and Rubik cube act. The students toured the campus and spoke with faculty in the departments the students are interested in pursuing. Cowley College faculty members Dr. Pam Smith, Bob Moffatt, Joe Clasen, Amy Roney, Paige Winslow, Holly Peters, Lory West and Frank Owens visited with students.